Congressman Peter Welch (D-Vt.) and an unlikely group of liberal Democrats and libertarian Republicans narrowly lost a bid Wednesday night to curtail collection of U.S. citizens' phone records. An amendment to the annual defense appropriations bill would have rolled back powers granted to the National Security Agency by the USA PATRIOT Act, restricting the agency's collection of domestic phone records to "a person who is the subject of an investigation." Welch was one of 111 Democrats and 94 Republicans to back the amendment, which was sponsored by Rep. Justin Amash (R-Mich.). The final vote was 205 to 217. In the days leading up to Wednesday's vote, the White House aggressively lobbied against the Amash amendment, dispatching members of the national security apparatus to Capitol Hill to talk lawmakers off the cliff. Though ultimately unsuccessful, this was the first major congressional effort to rein in the NSA's domestic surveillance powers since former agency contractor Edward Snowden leaked classified details of the NSA's wide-ranging phone data collection programs last month. The debate over such programs will move to the other side of the Hill next Wednesday, when Sen. Patrick Leahy has scheduled a hearing in the Senate Judiciary Committee to discuss oversight of government surveillance efforts. In addition to supporting the Amash amendment, Welch sought to use the defense funding bill to require Congress to sign off on any military aid to Syrian rebels. Working with Rep. Chris Gibson (R-N.Y.), Welch drafted an amendment to the bill that would have blocked funding for "military or paramilitary operations in Syria... without the express authorization of Congress." Since President Obama announced his intention last month to arm opponents of Syrian President Bashar al-Assad's regime, Welch has argued that such a move would "lead to the Americanization of this Sunni-Shia conflict." He and Gibson joined Sen. Rand Paul (R-Ky.), a Tea Party hero and fervent isolationist, at a Capitol Hill press conference in June to unveil similar legislation blocking military aid without explicit congressional approval. But their effort fell short this week when the House Rules Committee voted late Monday to block consideration of the Gibson/Welch amendment in the appropriations bill. 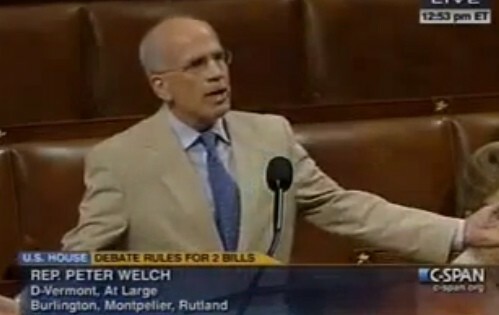 The next day, Welch took to the House floor to blast his colleagues for, as he put it, shirking its responsibility to debate military intervention in Syria. "I don't want this Congress to back into a policy, stumble ahead, where we find ourselves engaged in military conflict where we haven't even met our basic responsibility to have a debate about it," Welch told his colleagues. "We have to decide: Are we going to be men and women of Congress? Are we going to do our jobs? Are we going to be congressmen and women or are we going to be cowards? It is the coward's path to avoid taking responsibility for a momentous decision that we know at this moment is upon us." After his Syrian aid amendment was blocked and the domestic surveillance amendment failed, Welch voted against the underlying defense appropriations bill late Wednesday. Nevertheless, it passed the House by a vote of 315 to 109.